Marlene grew up on the north-west side of Chicago. Despite the amazing corned beef and matzo ball soup that she loved so dearly, she headed off to California as a young adult. Years later she found herself running a small bookstore in San Diego’s North County. Walter grew up in his parent’s bakery in Bavaria. He slept on cozy flour bags in the early hours of the morning while his father baked his famous breads and his mother ran the bakery. Taking after his father and grandfather, Walter began baking at an early age. After studying baking professionally he decided to tour the US. In 1982, he bought a motorcycle and started his trip across the states. His last stop, San Diego, was where he met his future wife and business partner, Marlene. Walter came in to the shop looking for a map. By some odd coincidence, Marlene was looking for a German language tutor. They struck up a conversation, (albeit, in Walter’s very limited English) had a few meals together, and eventually fell in love. 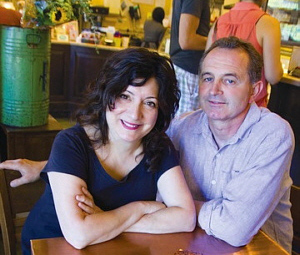 In 1987, Walter and Marlene Goetzeler made the move to Sacramento to buy Freeport Bakery. It was a small but delightful bakery specializing in cakes. They inherited seven staff members. During the past 30 years, the Goetzelers and their amazingly dedicated staff grew the bakery into an award-winning neighborhood bakery. Now employing more than 60 employees, many long-term, Freeport Bakery has become a Sacramento institution.